Selecting a D/ST in DFS is all about process. In this article I’ll show you the makeup of a valuable D/ST, how to identify the top values in a given week, and how to go about the position in cash games and tournaments. 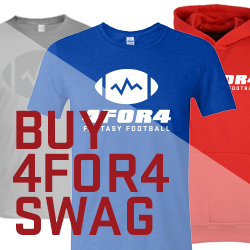 What are the Makings of a Valuable DFS D/ST? The table below shows the correlation coefficients between various relevant statistics and defense/special teams fantasy points per game. There’s a positive relationship between D/ST fantasy points and passing attempts allowed, and a negative relationship between D/ST fantasy points and rushing attempts allowed. Just as running backs need touches, wide receivers need targets, and kickers need field goal attempts, D/STs need to face pass attempts. Why? Only on a pass attempt can an interception or sack occur. Fumbles bring to mind running backs, but passing plays are actually responsible for more fumbles than rushing plays (57 percent to 43 percent in 2015). A healthy 86.4 percent of defensive touchdowns occurred on passing plays last season. An offense passes roughly half the time when leading or tied, but that figure jumps to roughly two-thirds of the time when trailing, which leads to a 70 percent increase in interceptions and a 29 percent increase in sacks for the defense. 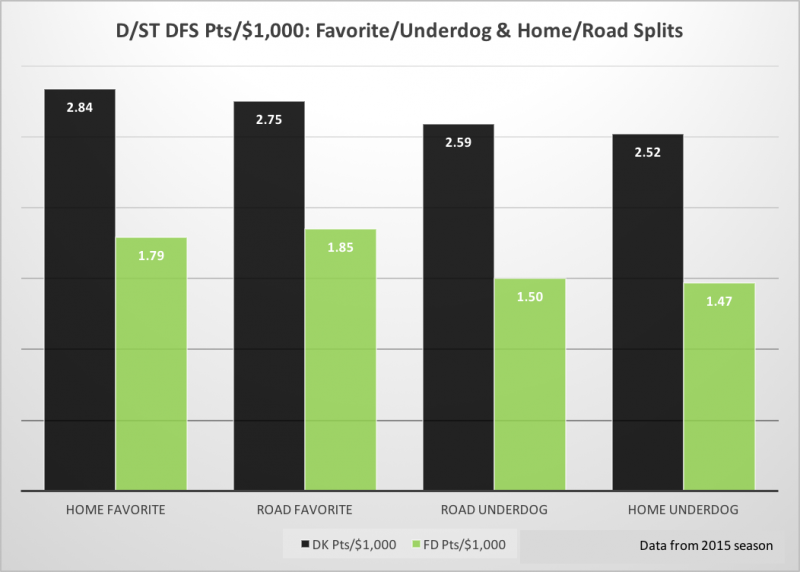 Whether at home or on the road, D/STs that were favorites returned more value than D/STs that were underdogs. Throughout the season, there will be instances when a bad team plays an even worse team. The bad team’s D/ST will likely have a depressed salary because it has performed poorly up until that point, but in a game against an even worse team, the bad team can still be valuable in DFS. Season-long fantasy owners will be familiar with this concept, which is the backbone of defensive streaming. A D/ST sees a significant bump in value when it faces an opponent with a team total below 24; if it’s below 18, the D/ST should be a chalk play. Points allowed had a relatively weak correlation to D/ST fantasy points, so why are Vegas team totals so effective? Because Vegas team totals actually do a great job of predicting those sacks and interceptions we’re after. The average offense allows only 3-4 sacks plus interceptions per game, so it’s vital to tilt the odds of them occurring in your favor as much as possible by targeting D/STs going against opponents with low implied totals. Just one or two extra sacks or picks could be a major difference-maker. Beyond the Vegas lines, you can also target specific quarterbacks for sacks and interceptions. Quarterback interception rate has almost no year-to-year correlation, but completion percentage does and is predictive of a quarterback’s future interception rate. Sack rate is a quarterback trait to a certain degree: roughly 44 percent of a quarterback sack rate in a given year can be explained by his sack rate the year before. Although the offensive line and opposing pass rush certainly factor in, some quarterbacks do a better job than others of getting rid of the ball quickly. Sacks don’t have the same touchdown upside that interceptions do: in 2015, 12.1 percent of interceptions were pick-sixes, but only 1.1 percent were scoop-and-scores. In fact, only 13 percent of sacks even resulted in a fumble. 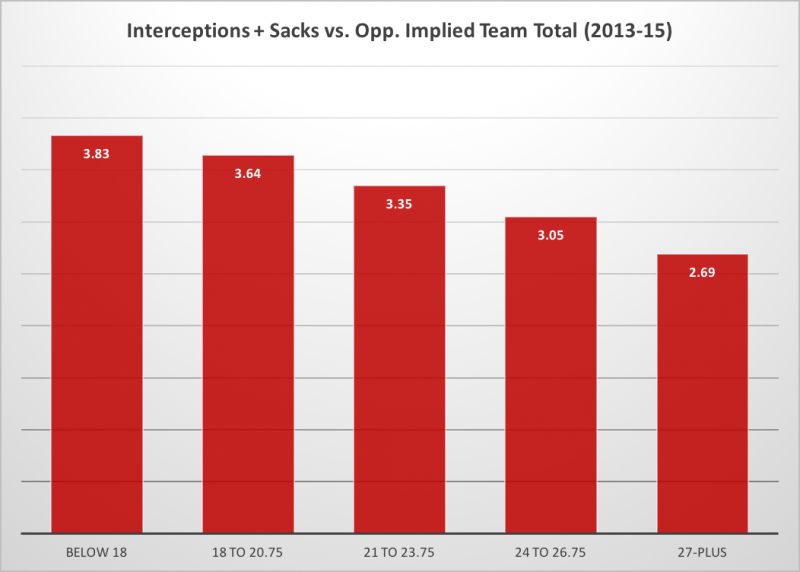 But sacks are still valuable because they occur more than twice as much as interceptions (defenses averaged 2.31 sacks and 0.85 interceptions per game in 2015). Putting it all together, a cash game viable D/ST would ideally be a favorite going against a team with a low implied point total. 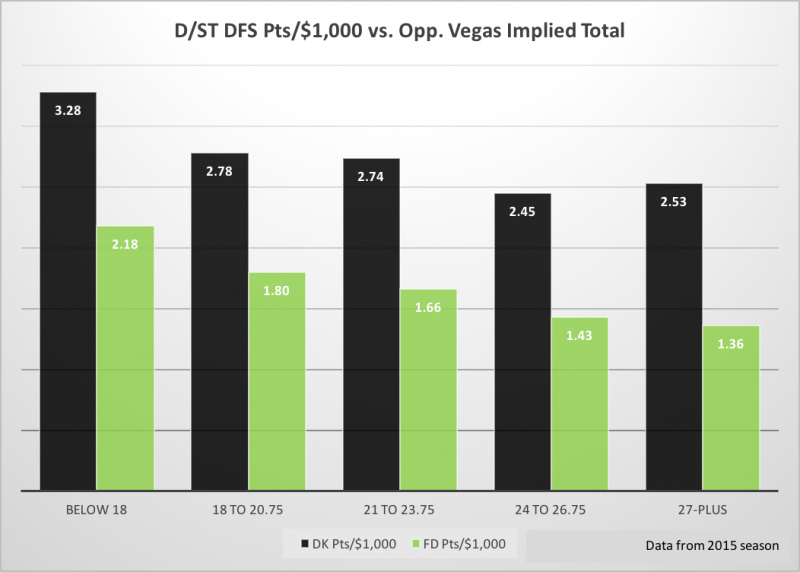 On DraftKings, a cash game viable D/ST can more or less be found in any salary range. But on FanDuel, the 4500-4900 range had by far the highest floor, while the 5000+ range had the highest ceiling, but a substantially lower floor. D/STs have the highest CV of any position, meaning their game-to-game results tend to fall further away from mean, and it looks like FanDuel is valuing the top D/STs according to their ceiling rather than their floor. Winners on DraftKings went a lot more contrarian at D/ST than winners on FanDuel. This likely has something to do with all the great value in the middle pricing tier on FanDuel -- people are hesitant to pay up for the expensive defenses, but those are the ones with the most upside. Quarterback-receiver stacks are the most popular, but running back-defense stacks are quickly catching on. It makes sense, as there is some correlation between the two positions (r = .11), although it’s nowhere near as strong as the correlations for quarterbacks and receivers, which all hover around .30 or greater. If you play on FanDuel, take note the position with the strongest correlation to D/ST is actually kicker (r = .29) -- a much higher correlation than the running back-defense stack. DFS is a game in which edges constantly erode amidst new ones forming, but for now it appears defense-kicker stacks are still being underutilized.